Here we go! A new favorite food. 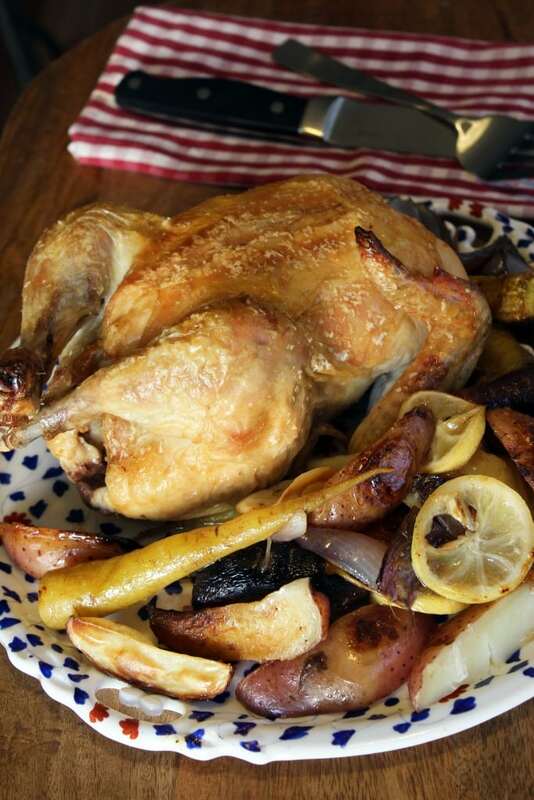 People go on and on and on about roast chicken and while I get it, I just kind of …. didn’t get it. Vague enough for ya? Jay had been wanting to roast a whole chicken for, say, ever, so for his birthday that’s exactly what we did! It turned out PERFECTLY, was incredibly simple, and we can’t wait to make it again. This is a simple version with nothing fancy, and that’s what was so great about it! It seems as if you don’t overcook the chicken then you’ll be golden. The bird was crispy on the outside, MOIST on the inside (let it go), and the veggies roasted in chicken drippings were just…..ahhhh yes. This is super simple, too! 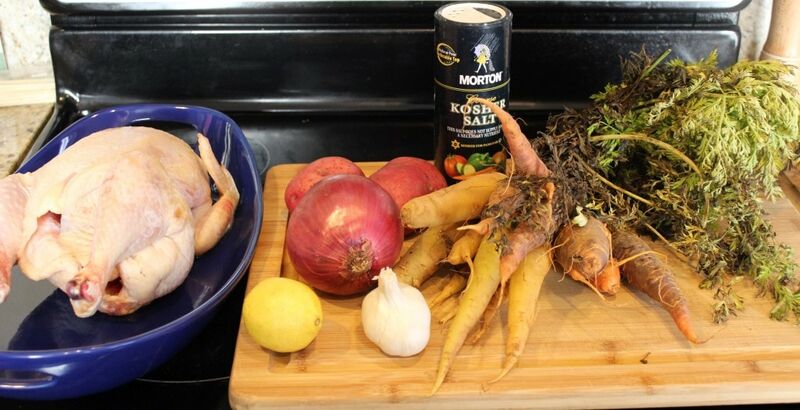 You need a chicken, 4 pounds or so, potatoes, carrots, an onion, a lemon, salt, olive oil, and some garlic. That’s it! Nothing fancy. The key to this chicken (method taken-ish from Thomas Keller) is a hot oven and plenty of salt for a crispy, salty skin. Chicken skin is good, I don’t care what you say. So, while you prep your veggies turn your oven to 450F and let it preheat all the way – something I usually don’t care about. Then, let’s get to work on the veggies! I made enough veggies for about 3 servings, where as a chicken serves 6 or so – we used leftover chicken for something else, so make more veggies if you’d like! 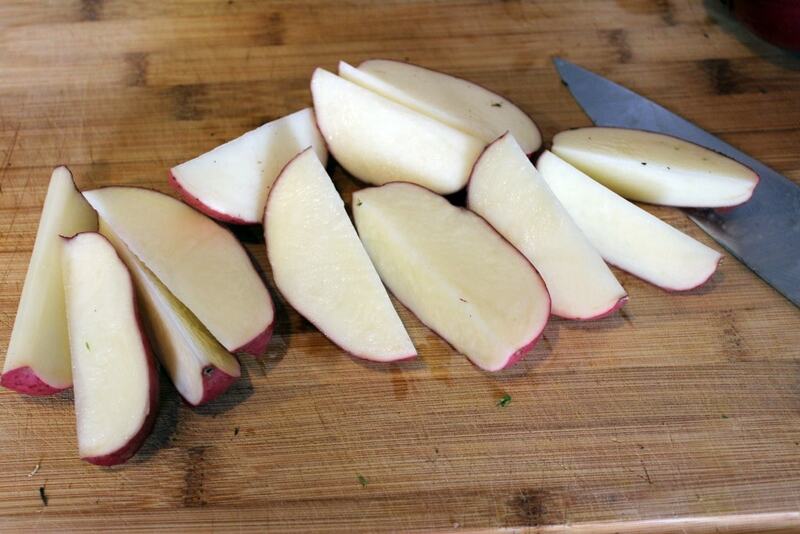 Cut the potatoes into large wedges – 6-10 wedges per potato. 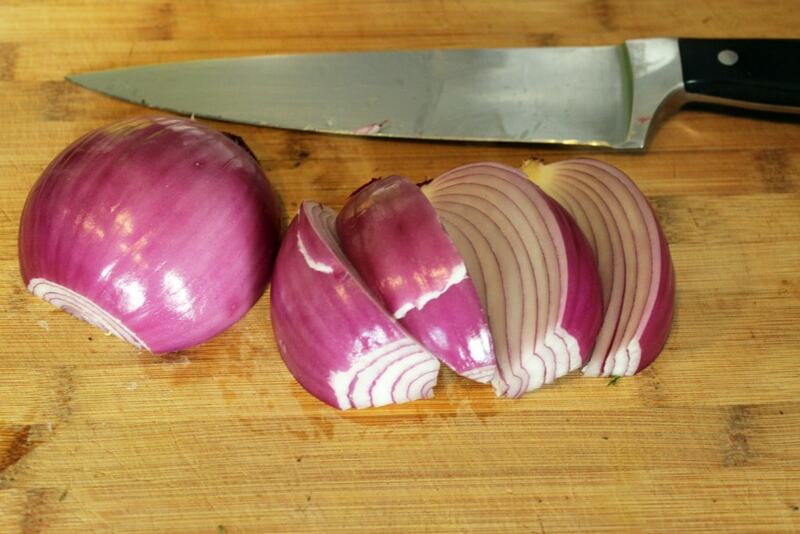 Then do the same with the onion, and cut the carrots into chunks. I left mine whole since they were small and so pretty that way! We want the veggies to be roughly the same size so they cook evenly. 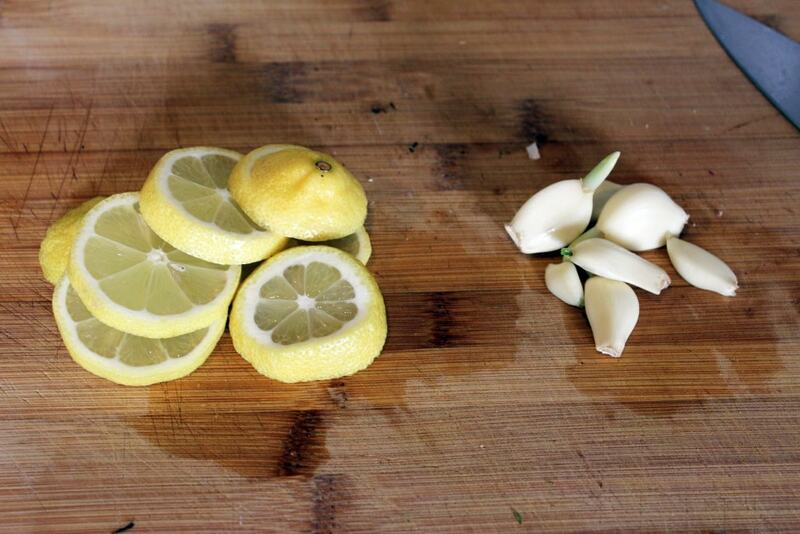 Thinly slice the lemon and peel the garlic cloves. 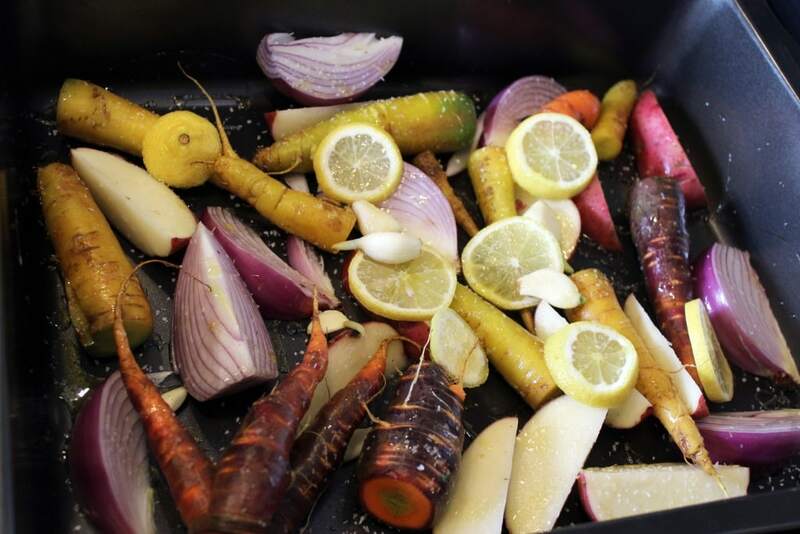 Arrange the veggies in the bottom of a large roasting pan, then scatter the lemon and garlic over top. Sprinkle the whole pan with salt and drizzle with a bit of olive oil. I’m obsessed with the colors here. Definitely use purple carrots if your husband goes to a concert and your friend who went with him asks you to pick up his CSA veggies and tells you you can cook with his purple carrots. True story. Now, onto the chicken! If you have a roasting pan with a rack, place the rack over the veggies – look! I like to do all the veggie stuff first then get the chicken all ready so we aren’t flopping back and forth between raw poultry and…everything else. For the chicken, grab some salt and twine. See how the salt is in a dish? That’s so I don’t have to touch the container as I’m salting the chicken. Do that. Before you touch anything, grab a paper towel and pat the chicken dry inside and out – this helps make sure the skin isn’t soggy. Sprinkle the chicken inside and out (I know, gross) with salt, then rub it a little bit. Use the twine (again, cut it beforehand) to tie the chicken legs together (feel free to truss more fancily than I did, but this worked just fine). 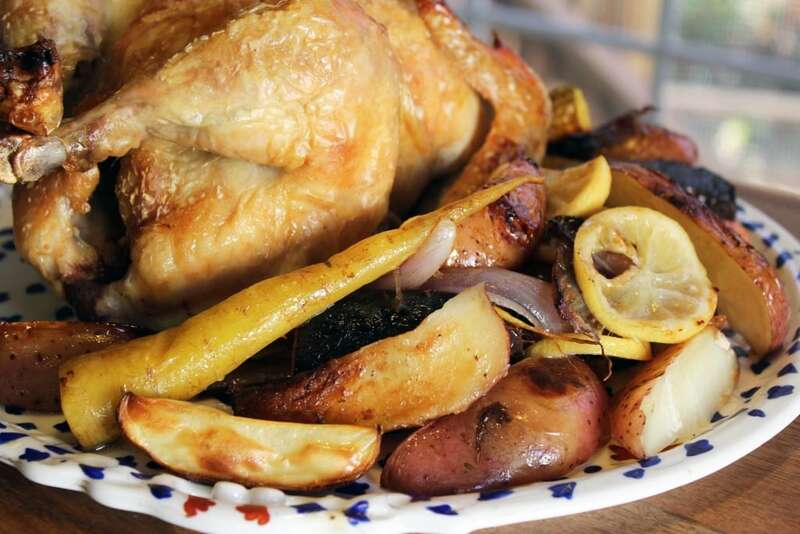 Place the chicken on the roasting rack or directly on the prepped veggies, and we’re ready to roast! Thanks for the sacrifice, birdie. It’s time. As far as advance prep goes for this, I suppose you could get to this point then stick the pan in the fridge, but the prep is so minimal for this dish that you’ll probably just do it all at once. 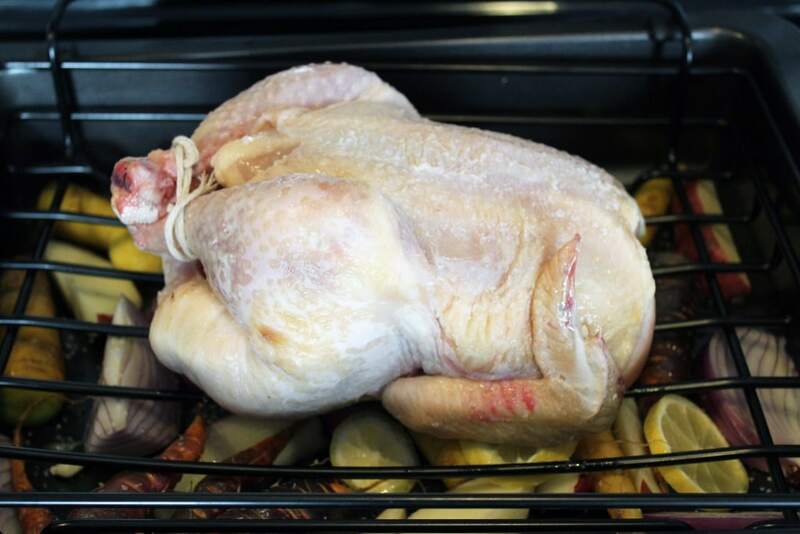 I roasted this chicken early in the day then stuck it back in a hot oven for 10 minutes to reheat and re-crisp the skin when we were ready to eat. 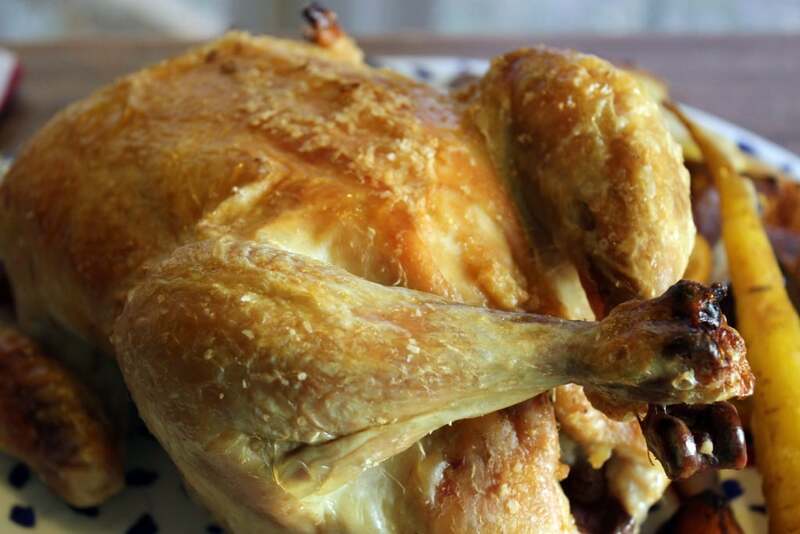 Roast the chicken for 50 -60 minutes until the chicken is golden on the outside and cooked through – a thermometer inserted into the thigh should read 160F. 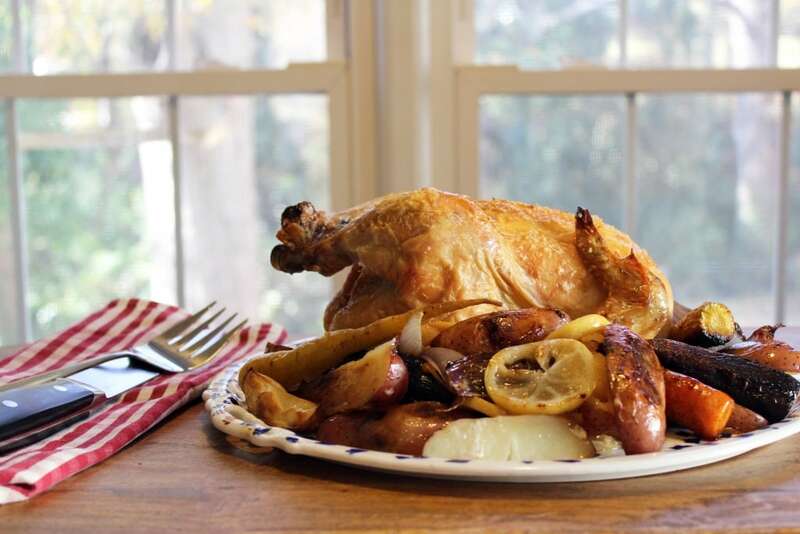 We want the bird to be about 165F when we eat it, and the temperature will continue to rise after the bird is out of the oven. 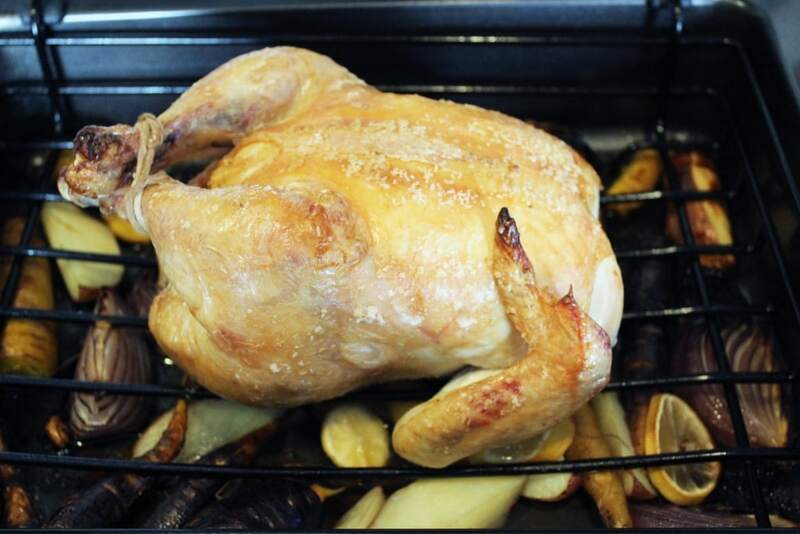 This is a roast chicken, guys. Remove the twine from the legs and serve the veggies alongside, and WOW. 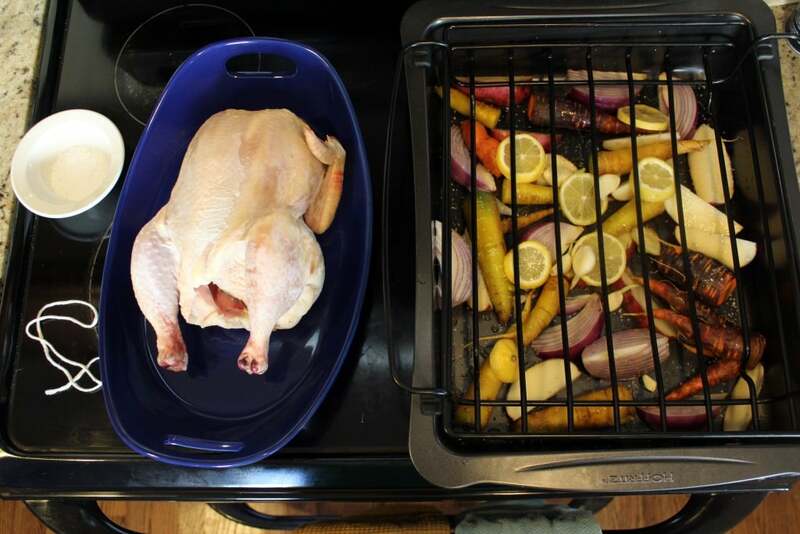 The chicken drips onto the veggies as it cooks, so we end up with roast veggies in chicken drippings and lemon. CAN YOU EVEN? 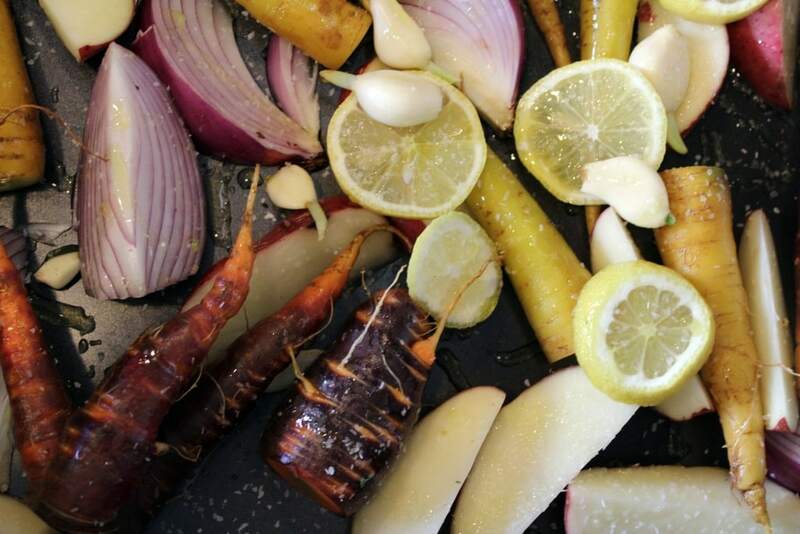 These were probably some of the best roast veggies we’ve ever had. Now, I didn’t carve this for you because I’m only one person, but here’s how I do it: Let the chicken rest for 15 – 20 minutes. It’ll be juicy because you didn’t overcook it, and we don’t want to loose all the juice on a cutting board! Then, cut away the thighs (attached to the drumstick). Cut the skin separating the thigh and the breast, then pull back the thigh, exposing the joint. Cut through the joint. Do the same with the wings. Now we have 2 wings and 2 thigh/leg sections off the bird. Cut the breast away from the sternum (no way it’s called that on a chicken?) in one piece on either side and slice the breast crosswise, leaving on the skin if possible. Done! Cut chicken. Google it if you’re unsure, or just give it a go! There’s more than one way to do anything right. That’s it, friends! 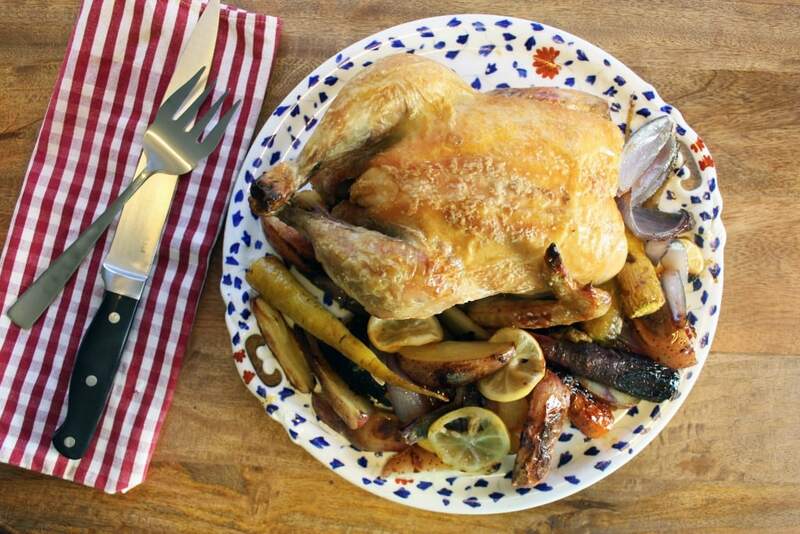 Perfect flavorful roast chicken and veggies. We’re already planning who to make this for next, and it was a HIT as a birthday dinner. Try it soon! Preheat the oven to 450F. In a large roasting pan with a rack, scatter the onions, potatoes, carrots, garlic, and lemon slices. Drizzle with olive oil and sprinkle with salt. Place the roasting rack over the veggies. Use a paper towel to pat the chicken dry inside and out. Sprinkle inside and out liberally with salt, and tie the legs together with kitchen twine. Place the chicken on the rack over the veggies. 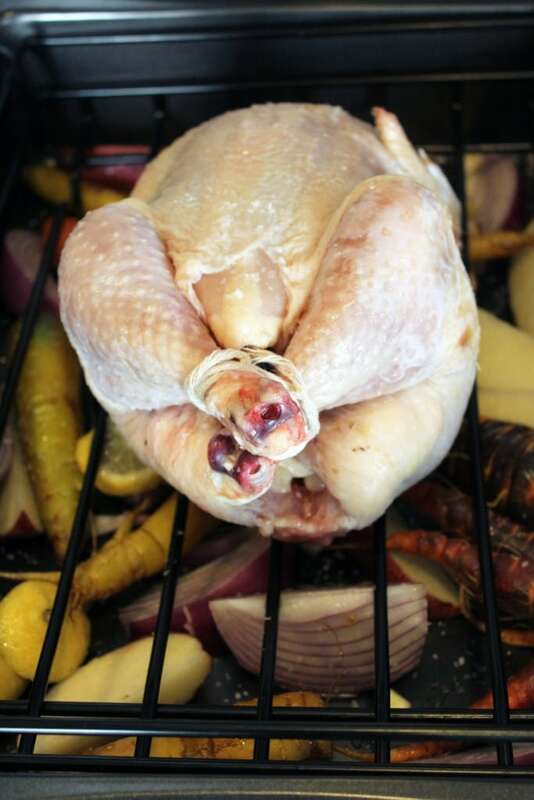 Roast the chicken and veggies for 50 - 60 minutes until the skin is crispy and internal temperature is 160-165F. Let rest for at least 15 minutes then gently carve. Serve the chicken with the veggies and any pan drippings. Prepare a paper towel, cut the twine, and put some salt in a small dish before you start working with the chicken to prevent contamination.